As autumn’s leaves fall, cleaning your gutters may not be at the top of your to-do list. However, when cleaning your yard, remember to also pay attention to the leaves in your gutters. 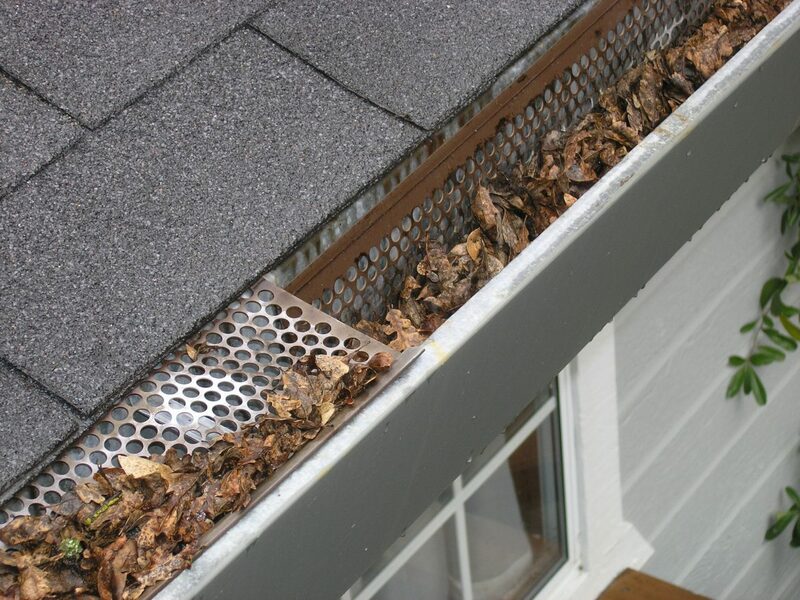 When leaves fall, it doesn’t take too long for your gutters to get clogged with leaves. Leaving them can cause larger issues, so do not wait until they are full to clear them out. Here is why you should get your gutters cleaned out every fall, no matter where you live. All it takes is a little moisture for the leaves in your gutters to turn into a soggy, heavy mass. While it may not seem like a big deal, those heavy leaves can clog drains, block scuppers, and invite mold, fungi, and mildew into your drainage system and roof. If not properly removed, this can lead to backed up water, which increases the load on the roof deck. Standing water, about 1 inch deep, adds five pounds per square inch to your roof. Over time, this weight can lead to serious problems. Over winter, pooling water freezes and expands, forcing its way into tiny cracks and flashings. The additional weight from the ice can cause structural damage and expensive repairs. This includes falling gutters, flooding in your basement or foundations, a cracked foundation, wood rot, and exterior staining. The best way to prevent damage to your home is to prevent it. If you have an area with standing water, you could have a blocked drain. Even if you don’t have standing water, you could still have a drainage problem with a partially blocked drain. During fall, frequently check and remove debris from your gutters to prevent buildup and blockage. Not every problem is caused by leaves. If you have trees that obstruct your gutters or roof, cut or trim them down as well as any areas where the trees hang over your home. If you have not cleaned your gutters since last fall, you may have some leftover debris from winter and summer obstructing a clear, effective flow. Scheduling gutter maintenance is entirely dependent on your home. In general, it is a good idea to clean your gutters once a year, but if your home sits beneath a lot of trees, they may need more frequent attention. Although cleaning your gutters is simple, the task can turn dangerous if you are not careful. Position a sturdy ladder near a downspout and spread a tarp under the section to be cleaned. Bring a bucket of tools and an empty bucket up the ladder and place them on an S hook. With gloves on and a trowel, remove large debris (leaves, twigs, etc.) and dump it into the empty bucket. Work your way toward the opposite end, away from the downspout. To clean out small debris, use a hose with a spray nozzle. At the end of the gutter opposite the downspout, open the nozzle and flush the gutter. The water and debris should drain the other end. If you have a clog somewhere, the water will not drain as well and you should address the problem. If you suspect you have a clog, work from the bottom of the spout at ground level. When you have access to the spout, insert the hose and spray nozzle set to full pressure up into the spout. Turn on the water and the stream should dislodge the blockage. If you still have a clog, you can also use a plumbers snake inserted into the spout from the bottom to dislodge the blockage. Cleaning gutters, especially in inclement weather when there is ice, snow, and slick surfaces, can be dangerous. Luckily, Titan’s Roofing Inc. offers affordable gutter cleaning and repair so that you will never have to worry about taking care of them yourself. Our gutters help you protect your home and landscaping by guiding rain into your gutters, through the downspout, and away from your home and plants. Titan’s Roofing Inc. offers a full range of residential and commercial gutter products, including seamless aluminum, copper, and custom gutter applications. Gutter protection products are also available for existing gutter systems or with the installation of new gutters.